Campeggio Les Madières si trova a Pordic, Côtes-d'Armor. Questo campeggio dispone di piazzole delimitate, sia ombreggiate che, senza ombra e piazzole poco ombreggiate. Camping Les Madières si trova nei pressi di una spiaggia di sabbia e di una spiaggia sassosa. È possibile affittare roulotte e casemobili. Il campeggio dispone di un parco giochi e di un campo sportivo. Per gli sportivi, il campeggio prevede diversi percorsi in bicicletta. Il campeggio dispone di una piscina scoperta. Al campeggio Camping Les Madières è possibile praticare windsurf e canyoning/canoa/rafting. Ogni anno un ispettore visita il Campeggio Les Madières, controllando oltre 200 tra attrezzature e altri punti di interesse del campeggio. L'ispettore è un dipendente ACSI e non lavora per il campeggio. We have been caravaning throughout Europe for twenty nine years and this site is the best. Owned by a lovely French couple who speak very good English and whose customer service is second to none.The large pitches are separated by different species of trees and shrubs make it a very pretty site. 10amp electric, free WiFi, hot showers cannot recommend it enough. Very end of season feel, so cannot comment on pool and cafe as they were shut. Was told not to put a groundsheet down to help grass recover ----even though it was breathable. We therefore ended up with grass cuttings in the caravan all of the time and more wear to the grass! The toilets were poor and of the two sit down types available, one had a split seat held together with sellotape. The disabled toilet was blocked off from use by a table. A small site outside the tired village of Pordic. No English spoken but friendly owner directed us to an emplacement with no choice, despite the camp being quite empty. Power lead a long stretch - widely spaces outlets. Toilet & washroom rather old and NO toilet paper . Pay to use weak Wi-Fi. Very quiet site, mainly used by Dutch campers. Small town of Binic nearby is most attractive. Quite tricky to find through the fairly scruffy town, although well signposted. No English spoken, mainly Dutch campers. Were told which emplacement ie no choice. The small town of Binic is a short drive away and has many bars and a fantastic beach. Very quiet site - good for walkers - clifftop nearby. The friendly, English speaking owners made us feel welcome at this peaceful, countryside site with distant views of the sea. The site offered eat-in or take-away menus for the visitors. We could only stop one night because of motorhome problems but would definitely return and recommend it to others. 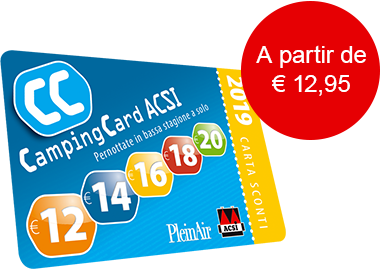 ACSI Eurocampings invia la tua richiesta di informazioni al "Campeggio Les Madières".